Brain Awareness Week keynote speaker Jeannette Haviland-Jones, Ph.D., offers flowers to her husband, Terry McGuire, Ph.D., a Rutgers professor of genetics. Flowers are a symbol of happiness and good cheer. But new research reveals that the sweet scent of flowers may serve a sneakier purpose: co-opting humans into propagating and protecting them. This thought is leading researchers to the idea of emotion as an evolutionary force. Here’s how flowers help support the so-called Big Bloom theory of evolution: Flowers cause positive emotions, and research shows that from an evolutionary standpoint, positive emotions make people better survivors. That’s because positive people are more likely to maintain social relationships, reproduce, find needed resources and be creative. Many flowers and plants rely on humans to fertilize them, nurture their growth and remove the weeds that would choke them to death. In return, they give us pleasure. “The way they repay us is that they have developed little chemical factories that decrease anxiety and improve our mood,” Haviland-Jones said. In studies of whether flowers make people happy, Haviland-Jones and colleagues at Rutgers found that women who were given flowers all smiled with true enjoyment, a type of smile called the Duchenne smile, which is associated with the raising of the cheeks and crinkling around the eyes. Such a smile has been linked to positive emotion and related changes in the brain. At the end of the study, people who received flowers reported being happy, but people who instead received candles as gifts did not. Over the study period, those who had gotten flowers also had spent more time with others and got around to doing social activities they had been putting off. This showed that flowers had a social influence. In a follow-up study, Haviland-Jones’ team handed out flowers or pens to elevator riders. People who got flowers broke the usual elevator behavior of standing as far back as possible and looking up at the changing numbers or down at the floor. Instead, they moved closer to the middle of the elevator, smiled the Duchenne smile of true enjoyment, and even initiated conversation. That effect was not seen when people were given pens instead. 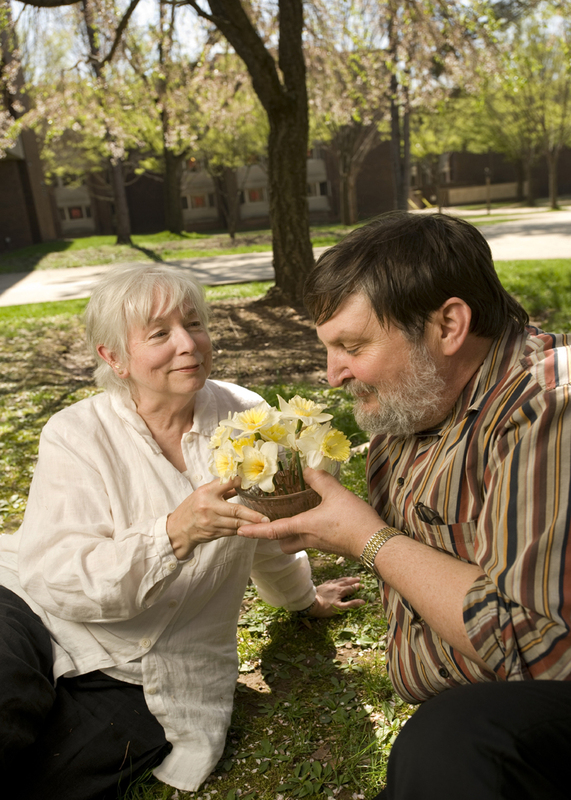 Armed with their new evidence of how flowers affect mood, the researchers decided to study older adults, who risk becoming less sociable and more depressed over time. They found that the more flowers the older adults received, the happier they were. Unexpectedly, people who got flowers performed much better in memory tests than those who did not get flowers. The study raises the question of whether the flowers simply cause a change in mood, which affects motivation, and, in turn, memory, or whether the flowers cause an actual change in memory function. “We don’t know, but it certainly opens up the possibility,” Haviland-Jones said. Media representatives are encouraged to call in advance. Valet parking is available at Shands at UF, 1600 SW Archer Road. For more information, call Czerne Reid at 352-273-5814 or email czerne@ufl.edu.